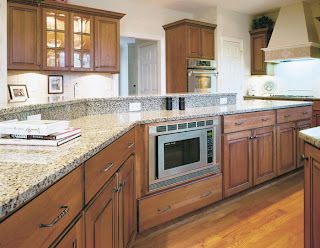 So many of the beautiful kitchens we have designed have been from our Shiloh Cabinetry line. This is mostly because Shiloh makes it so easy. They offer a wide selection of door styles and the quality is impeccable. Plus, they are competitively priced and offer many features as standard -- such as glazes -- that other lines charge extra for. This month we're featuring three finishing options -- Olde World and the all new Vintage and Weathered (featured right) options. The distressing techniques are hand applied to create a distinctive, authentic look. The Olde World line features eight color options. The Vintage and Weathered lines each have seven color options which are unique to them. In the next few months, Shiloh is adding new door styles and offering frameless cabinets. For more information, contact us.